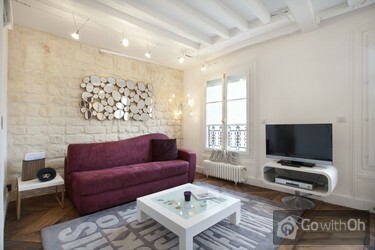 This short term rental in Paris is located in the Latin Quarter and ideal for 4 people. It has a stylish interior decoration with a lot of modern and contemporary touches. The Paris apartment vacation rental overlooks the courtyard and has lovely views of the Parisian rooftops, making it a romantic spot. It consists of a main room with a kitchen, a dining area and a double sofa bed, a bedroom with a double bed and a bathroom with a shower. Ideal to enjoy the real Paris, you can walk to many points of interest including Notre Dame, the Louvre Museum or even go shopping on the Boulevard Saint Germain. You can even have a coffee at the Deux Magots, which is a historical café with a literary past, wander through the art galleries, dine in the famous Latin Quarter or have a romantic candle light diner on a bateau mouche. Metro stops Saint Germain des Pres and Odeon are on line 4 which run through the city from North to the South, and through Châtelet. This short term apartment rental in Paris is not suitable for babies, therefore the owner will not accept bookings of families with a baby. Mooi appartement met perfecte ligging tussen leuke winkeltjes en gezellige restaurants. Appartement was erg netjes en leek als nieuw. Een aanrader! J'ai été très content, position idéale à Paris, l'appartement était agréable, propre et facilement accessible. L'ALOGGIO ERA CONFORTEVOLE ED ELEGANTE, ZONA MOLTO CENTRALE E BELLISSIMA, MEGLIO NON POTEVIAMO TROVARE, CI SIAMO TROVATI VERAMENTE MOLTO BENE, L'APPARTAMENTO E MOLTO LUMINOSO E SILENCIZO. TV SOLO IN FRANCESE. SERVIZIO OTTIMO, PERSONE DI UNA GENTILEZA UNICA, SI DEVO TORNARE TI CHIAMERO A CLEMENTINE, SIETE MOLTO DISPONIBILE E EFICIENTI. everything perfect, apartment new and in a perfect position, thanks! We thoroughly enjoyed our stay in our Paris apartment. The location was excellent, perfect for sunset walks along the Seine and close to shops, supermarkets and cafes; the apartment was pretty as a picture, relaxing, private and incredibly quiet; it was lovely to meet our contact Stefan, who was ...kind, helpful and friendly. Arranging the time to meet in advance was helpful as all we had to do was turn up on time, and there was Stefan to meet us. We were very happy with our stay and we do not have major complaints. The only commnet we would like to make is that the description about views of Paris is misleading. There is no views at all. It did not bother us at all, but should not be mentioned in the description. The location is excellent. ...The place is very quite & that was really good to stay in the city centre and still to not hear any noise from the streets. Stefan was a delight to deal with. He was pleasant and helpful in assitng us with information about where to go and what to see in the area. Die Beschreibung auf der Homepage entsprach den Tatsachen. Sehr erfreulich! Alles war sehr einfach zu organisieren. 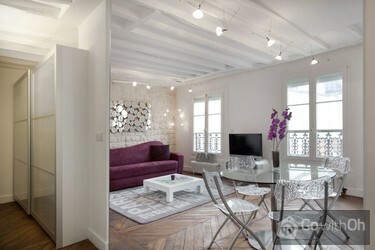 We really enjoyed our stay in Paris and loved the location of the apartment - it was superb! S. was extremely helpful and very prompt with his times. He also spoke very good English which made it so much easier for us to communicate with him. Beautiful mix of old building, sensitively restored and with a very contemporary fit-out! We will definitely look to stay there again next time we're in Paris. Really Good service provided across the board. Need to make sure that you have plenty of Cash though as the balance and deposit has to... be paid in cash on arrival. I appreciate the issue of check out, cleaning time and next arrival, however, some possible facility for left luggage would be of benefit. Visiting Paris fairly frequently we have always chosen hotel accommodation in the past. We are so pleased that we chose to try Paris Apartment living as it will be difficult to return to any hotel in the future except for very short stays. Our accommodation lived up to our expectations . The comfort and the security aspects of the apartment were ideal. Das Appartment hat alle Erwartungen erfüllt, in punkto Ausstattung, Sauberkeit, ruhige Lage, sehr zentral gelegen. Wir werden es weiter empfehlen und bei unserer nächsten Parisreise wieder buchen. The apartment in general was good, the location was EXCELLENT! however the wooden parquetry floor was quite squeaky & the apartment would benefit from the addition of a queen size bed. all else good especially the kitchen utensils etc. thanks for a lovely stay. L'alloggio è molto carino, comodissimo alla maggior parte delle bellezze parigine nonchè alla metro a meno di 5 minuti a piedi. Qualora ritornassi a Parigi di sicuro affitterei nuovamente questo alloggio. Great rennovated apartment in an older building. Good location, close to numerous attractions. Very friendly and helpful contact person. Would definitely recommend this apartment to others. We stayed for 4 nights, and it was perfect. We will come back!!! The neigbourhood is great, a lot of little shops, a supermarket and a parking garage opposite the house. Gut wäre wenn das Gepaeck aufbewahrt werden koennte z.B. bei der Concierge. 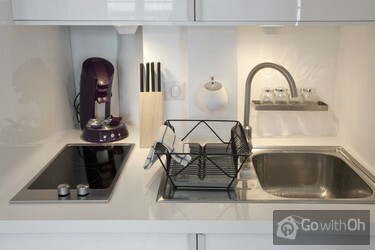 This apartment is in an old building, small apartment but the space was well used, and the decorating very appealing. Apartment is in a fantastic location (Latin Quarter) close to lovely restaurants, and Notre Dame Cathedral, Metro & the Louvre. Nice appartment. Smashing location. Friendly seviceperson. Fair level of cleanliness :-) just take out the dishwasher form the apparmtent's description as there is none. Alles perfekt und sehr gerne wieder. Für uns die ideale Location in der wunderbaren Stadt. 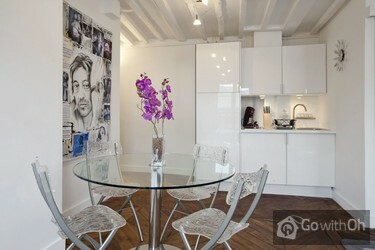 Do yourself a favour & book this beautiful apartment. Stop hunting & book it! We had the most fantastic, easy to book/ find, quiet stay. Close to absolutely everything, clean, fantastic accommodation. If you're lucky enough to find it available, grab it! The owners were delightful to deal with, full... of great recommendations & insight. Fabienne was amazing to deal with & full of great ideas for sightseeing. We will be back! El suelo de madera hace algo de ruido, es el pequeño fallo que se puede comentar de este maravilloso apartamento. Muy limpio y con una persona de contacto encantadora. Muy muy recomendable. Fantastic 'tres chic' apartment in a magnificent location. Close to supermarket, restaurants, boutiques and pubs. Bus stop right outside door and Metro 5 mins walk away. Couldn't ask for anything better. Apartment was tastefully furnished with all mod cons. Our only recommendation would be for ...written instructions for washing machine and intercom - it's all a bit much to take in at once when you are sleep deprived from a very long journey. Only downfall with the arrangement was having to carry such a large sum of money (being balance of accommodation payment and bond) in cash, then receiving cash on departure and leaving the country straight away. It would be great to have the option of paying in advance as the deposit was paid. Sehr schön und sofort wieder! It was a very good location, clean and it had everything we needed for this trip. Great location close to a wide range of cafes and restaurants. 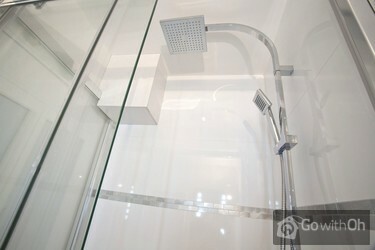 There was plenty of room for the three of us and it had all it needed to make us feel at home.The only problem was the temperature control in the shower as we were not able to regulate the temperature. The agents that we dealt with on ...arrival and departure were very friendly, helpful and punctual. We stayed for one week in this lovely apartment. We loved Paris...We loved the apartment, so quiet, so nice and sunny at noon. The location is really perfect. The area is nice with lot's of restaurants and bars. Using the shower is a little bit tricky. You might have some problem s with the hot ...water.We consider some instructions how to use it might be useful. Also one more set of towels would be good. Especially for more then 3-4 days stay. El departamento es precioso y muy cómodo, la ubicación excelente y tuvimos muy buena atención de parte de las personas de contacto. Muy recomendable! Gracias! Leider fehlte eine Verbindung vom Fernseher zum DvD Recorder , sodass man keine DVDs gucken konnte . Dear Customer, From Oh we thank you for your feedback and apologize for any inconvenience caused by the construction work in progress in the building. We confirm that the owner has applied a discount for the period of the works as compensation for the inconvenience it may have caused. Location could not have been better for our purposes of our trip! Grocery store directly across the street as well as parking (even though we did not). 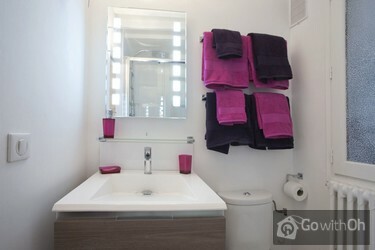 In the photos for the website, the bathroom showed multiple towels. This was not the case, we would like to be pampered when we travel and choose ...our accommodations accordingly. We are not spending much time in our apartment, but what time we do spend, we would like nice, generous bedding/pillows, towels and toiletries. The coffee machine did not work either. Please remove these things so we don't buy materials for non-working items. Dear client, From Oh we appreciate and thank you for your comments. The property owner has confirmed us that he already checked all equipment and concretely assures us that the coffee machine works correctly. no pudimos regular el agua caliente del baño por no saberlo ni tampoco estaba indicado como hacerlo. Four very happy days in a lovely and quiet apartment in a great location. One evening we walked across the Pont Des Arts to see the Eiffel Tower lit up, another evening we went to a little club called Chacha just over the river and we spent many euros on beautiful bread and cakes at the boulangerie just up the road. The apartment was in a superb location and ideal for 3 friends on a short break. It was great to have the space to relax in the apartment and we loved the surrounding cafes and shops. Welcome in Paris was excellent - good communication throughout process. El alojamiento es muy confortable y muy acojible. Very noisy wooden floors, no towel or linen change over 10 days of stay, apartment not very clean. Cutlery and glasses limited and mismatched. Initial requests regarding earlier access was not responded to. Contact info was clear. 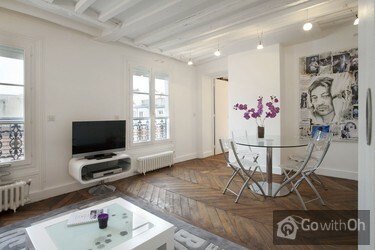 The locaiton of this apartment is fantastic -within walking distance of many major sights. The buiding and street were quite quiet. The check in procedure was clear and easy to use too. Overall, it was a good choice for a few days in Paris. The whole check in process was clear and it was easy to... pay and understand the steps. We've rented many places and this was amongst the best for organization. The apartment was well represented in the pictures too. We arranged to meet the agent at 11pm because of the timing of our flight and we were on time but we had to wait on the street with our children and all of our luggage for about 10 minutes. It wasn't a huge problem but I would have expected him to be waiting for us or to be on time given that we had to pay him 50 euros. We couldn't find any instructions for the washing machine. It also said on the brochure in the apartment that it was cleaned to hotel standards but that was a bit of an overstatement, e.g. the cups needed a good wash before use and there was mildew in the shower and lots of dust on the bathroom vent. It was very enjoyable time in Paris. Apartment location could not be better. Die Wohnung ist sehr schön und praktisch, allerdings in einigen Detail etwas abgenutzt. Fantastic location, creaky floorboards but to be expected for an old building. A little limited in kitchen cooking utensils but otherwise well stocked. Hot water temperature in the shower fluctuated between hot & cold but decent pressure. Had to wait over an hour in the cold & rain for the keys despite advising the timing of our arrival. 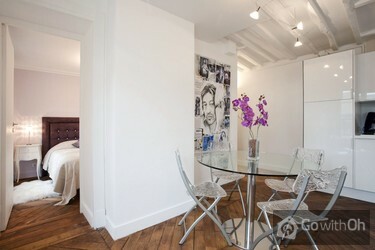 The apartment was fantastic right in the here of Paris. Shops, Galleries, Restaurants, Supermarket & Artisian Baulangeries all within 2 minutes.Most attractions are walkable or hop on the Batous Bus on the Sienne River. The apartment was so quiet & dark for sleeping at night. The only thing needing... improving is the floorboards squeaking. It was just like the photo. great location & ambiance. 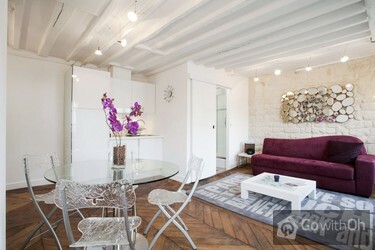 Fantastic location right in the heart of St Germain. However the floor boards are very squeaky and need replacing. Great electric shutters on all windows blocks out the light. Very quiet apartment for where it is situated. Tiny lift to level 5 but ok for one person and luggage. Management agent was prompt to contact, correspond and meet to pass us the keys to the apartment. 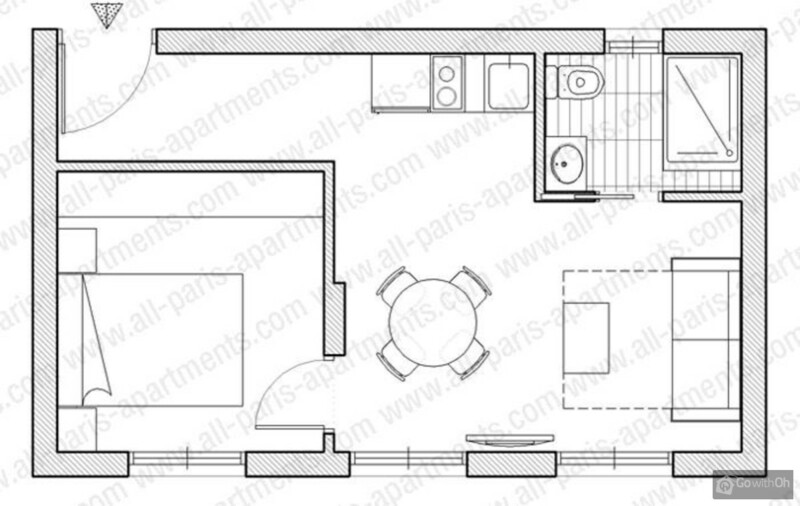 Instructions were clear.Ideal location, close to Metro and short walking distance to the Louvre. Safe to walk along the street adjacent to apartment. Many art galleries, restaurants and cafes just ...outside apartment. State of accommodation could be improved. Wooden flooring really uneven, uncomfortable sleeping on bed with a gradient; with head area lower than feet. Pillows were few and really flat. Wooden flooring was so noisy when walked on.Cleanliness of apartment could be improved; flooring was dusty and toilet bowl was not cleaned up.Electric water pot and cooking utensils were rusty. Good appartment to stay with a family of 4 people for a few days. Good and quiet neighbourhood. Just a few small negative points: squeeky floor, kitchen wear not 100% clean, senseo did not work and we only had limited access with wifi (? - not usable anyway). Bank bed was easy to open and had a good matras! Best location of the apartment. The owner is very friendly. Average apartment, uneven floors and very creak. Washing machine inside is very dirty and musty smell things postrirat succeeded only hands but not all. A big plus, opposite the apartments on July 14 opened a minimarket. The responsible person was on time and very pleasant showing an apartment. We with my family liked an apartment and its location. We felt comfortable and it let us to enjoy our family time in Paris even more. We appreciated that a flat was well equipped. And its design was pleasant for our eyes. L'appartamento è posizionato in una zona molto bella di Parigi ,comodo anche per gli spostamenti in metro.E' attrezzato con tutte le comodità è tenuto molto bene .Siamo stati accolti molto bene . L'appartamento è molto grazioso e funzionale, è vero che il pavimento scricchiola un po' ma ha il suo fascino un po' retrò, che ben si sposa con l'arredamento di gusto moderno. La collocazione è perfetta ottima per muoversi a piedi e ben collegata coi mezzi. Il quartiere è sicuro e pulito ...anche se pieno di vita. Il soggiorno piacevole e facile, grazie al punto cucina, volendo, consente un notevole risparmio per colazione e cena. Consigliato !!!. The apartment is in a great location, with a mini super market located across the road with a wide variety of stock. There are lots of good restaurants/cafe located in the surrounding area, which although busy at night feels extremely safe. In regards to other reviews, the floor does creak but I do ...not see the problem with this. The lift is small but it does the job. The bed is comfy, but the pillows are quite flat. The only major thing I would say is that is you were to arrive in unsociable hours the shop would be closed and no amenities eg milk ect provided in the apartment. Would definitely stay again. Dear client, Thank you for your comments. The owner confirms that he has put new pillows. There was a fire in a part of the building below our apartment. Someone tried to raise an alert but we didn't realise. I think it was another resident. We were about to evacuate when a firemen told us to stay in the apartment with the door closed. We then waited but received no further instructions ...and weren't given an all clear. I think some thought needs to be put into a fire procedure at apartments.We still enjoyed our stay. Dear customer, we appreciate and value your feedback. The owner is very sorry for any inconvenience caused by the fire in an apartment on the first floor, and reiterates that he is available to assist clients during the stay. Me gustó la ubicación lo cómodo y tranquilo ideal para descansar después de pasear por París. El apartamento con todas las comodidades lo unico que falta es un extractor en la cocina para poder cocinar. Pero pude conocer y relajarme a la vez en París. Recomendadisimo. Het is een mooi appartement en een uitstekende locatie. Het enigste was dat de overdracht van de sleutel niet goed was geregeld we hebben 2 uur moeten wachten tot dat we in het appartement konden dit was vervelend aangezien je erg vermoeiend bent van de reis. Ik heb 4 dagen van te voren aan gegeven ...hoe laat we zouden aan komen dit moest en heb ik ook gedaan,maar tijdens de reis een mail gekregen niet gelezen omdat ik onderweg was en geen mail kan lezen dan moest je nogmaals aangeven hoe laat je aan kwam dit niet kunnen doen dus er was niemand die ons ontving dit was vervelend,maar verder was alles goed. La ubicación fenomenal,fuimos atendidos por M., gentil,muy colaboradora,muy educada.El apartamento esta ok para dos persona,no lo recomendaría para el verano por no tener aire acondicionado,el sofá cama esta desastroso,hundido hasta los apoya brazos desdice del apartamento,sucio y mal ...olor,realmente deberían cambiarlo o retapizarlo.Por lo demás todo bien lo repetiría en otoño o invierno. el servicio y la atención de la persona que nos atendió en la entrega del apartamento estuvo muy bien. Apartment matched pictures on website.We really loved the location, walking distance to heaps of main sights.Great bed, shower, heating, security and it had a lift! M was very helpful at all times, thank you M.
Everything was fine. M was very friendly and allowed us to leave our stuff in the apartment till the late afternoon so we could still go the the Centre Pompidou before leaving.Just two small points/suggestions:a) For some odd reason there was no hot/warm water in the washbasin in the bathroom;b) The... heating systems functions very well so, when it really became too much, we tuned it down to "1" , which seemed the lowest acceptable level. And then the heating shut off altogether. Fortunately the restart button worked flawlessly as we found out. To avoid anxieties you may wish to explain visitors not to worry about the system off as it caused us some anxieties. For the rest it was all fine and very agreeable. Recommended! Sehr empfehlenswerte Wohnung. Ruhige, aber zentrale Lage. Tiefgarage gleich auf der anderen Strassenseite. Diverse Restaurants und Bistros in unmittelbarer Nähe. Alle Geräte in der Wohnung in funktionsbereitem Zustand (ausser Wasserkocher). Der Kleiderschrank war leider zum Teil mit ...wohnungseigenen Dingen belegt. Unser Aufenthalt verlief völlig problemlos und sehr angenehm. Aunque el tipo de suelo, le da personalidad y encanto al apartamento, sí es cierto que necesita una reparación. Pero no es inconveniente, en el segundo día te olvidas de él. Todo lo demás perfecto, hemos disfrutado mucho la estancia en París. Leider befindet sich die gut durchdachte und designte Wohnung in einem mittelmäßig gepflegten Zustand. Sie hat schon bessere Tage gesehen und müsste grundgereinigt werden. Das Sofa, das uns als Schlafstätte für die dritte Person diente, hatte einen Fleck und wurde erst am Tag nach unserem Einzug mit einer Matratzenauflage ausgestattet. Sehr geehrter Gast, vielen Dank für Ihre Rückmeldung. Der Eigentümer bestätigt, dass der Matratzenschutz versehentlich im Schrank aufbewahrt wurde, anstatt diesen vor Check-in wieder auf die Matratze zu legen. Die Kontaktperson kam jedoch unverzüglich vorbei, um dies nachzuholen. Apart from the noisy floor boards everything was great.A wonderful hostess.Safe and secure appartment close to everything. This darling apartment was just as pictured. Our contact person, M., was very pleasant to deal with. The bed was comfortable and all was very clean. The location was great-charming neighborhood near many cafes and within walking distance to many monuments and museums. Even though the ...neighborhood was busy and noisy at the street level, once inside the apartment, it was very quiet (even with the windows open). We felt very safe, also. Yes, the floor is squeaky, but the building is old. The only disappointment was the coffee maker. We could not it get it to work. I also appreciated being able to email and call our contact person who let us in the apartment and explained what we needed to know. She was very pleasant and informative. We would stay here again! Tolles Preis-Leistungsverhältnis. Schöne und SEHR saubere Wohnung, die nicht zentraler liegen könnte. Das leben tobt drumherum, aber die Wohnung ist absolut still, da nach hinten gelegen. Die Kontaktperson (M) war äußerst zuverlässig, pünktlich und sehr freundlich. Alles war - wie immer - ...super organisiert und hat den Aufenthalt in Paris nochmal um so schöner gemacht. Wir sind begeistert!!! Ein ganz großes Dankeschön. The best aspect of this apartment is location-location-location. M à été très pro, agréable et patiente (je suis arrivé en retard, elle très gentiment attendu avec le sourire!). Merci et encore pardon pour ce retard.Appartement très bien situé, propre, équipement parfait et conforme. Location is perfect. apartment is quiet, no noise from the street as it faces an inner courtyard. The sofa bed is not comfortable and the sofa itself is looking tired. There was not a hinge in one of the windows. The place is in need of painting . if you like a hard mattress then it is perfect for ...you as this is the type that is on the main bedroom. The chairs are not comfortable at all.The non stick frying pans were not for use. It must be said that when raised with M she contacted owner and these were changed straightaway. The apartment is clean. I think it does not offer value for money and the owners do not make the effort to keep apartment up to the standards to which they charge. it could be a superb apartment. Dear customer, we appreciate and value your feedback. The owner regrets that your stay was not satisfactory and confirms that both the sofa and chairs are in good condition. The apartment owner confirms that the new tools were already in the apartment so that the contact person did not have to take them, and to tell the client where to find them. Appartement très bien situé. Très calme. Ubicación excelente, muy lindo departamento, muy bien la anfitriona. Everything was amazing. M was great! Great location. Easy walking distance to many of the major attractions. Many restaurants and cafes nearby. Largish supermarket and great bakery 150 meters away. Mini supermarket across the road. Comfortable bed. Good shower. Helpful and obliging staff. Quiet street. No traffic noise. Tenants in adjacent apartments very quiet. They should have had cable tv. Nous sommes très satisfaits, l'appartement était très bien situé et très propre. Great location, clean and bright. The owners were great. BUT the floor is very uneven ( the feet at the bed head are propped on large books (Lonely Planet Spain) and some of the wooden sections are loose. The floor is so uneven that it feels like being on a boat at sea! I don't think it is fair to charge top rates when the floor is substandard. Appartement charmant, fonctionnel, bien situé, et très agréable. Le calme malgre sa location dans un quartier anime.Le matelas devrait etre change et le parquet repare. 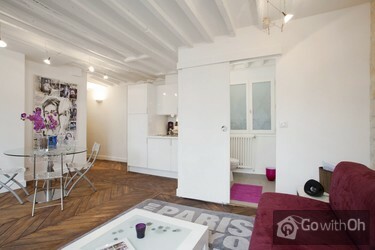 Nettes, ruhiges, gepflegtes Apartment in zentraler Lage von St-Germain-des-Prés; sehr guter Ausgangspunkt für Stadtbesichtigungen; viele Restaurants in unmittelbarer Nähe. Perfect Location. Loved Everything. The apartment could use some updates but overall we were very happy! Wir waren schon das 2. Mal in dieser Wohnung, weil sie gemütlich ist und die perfekte Lage hat- mitten im Zentrum, trotzdem ruhig, da nach hinten gelegen.. Der Service der Vermieter ist excellent. Auch der Service von All-Paris-Apartments ist fantastisch. Solche Geschäftspartner würde ich mir ...mehr wünschen. Die Küchenausstattung ist etwas spärlich. Zumindest ein Schneidebrett zum Kochen wäre schön.